Are you looking for an independent and transparent charity with over forty years history to support or to meet your corporate social responsibility? 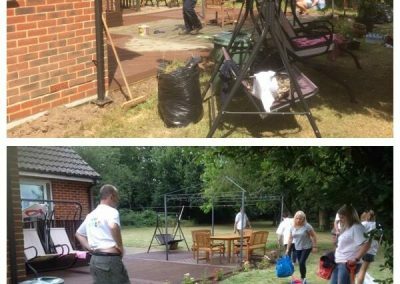 With a presentation to suit your timeframe we will come directly to you, alternatively we invite any businesses or groups to come to Acorn Village to meet the people who will directly benefit and experience first-hand how your support will make a difference. As an independent charity, our priority is always supporting adults with learning disabilities, however our small team can help with.. Choosing to support adults with learning disabilities will help motivate your staff all year round whilst supporting a transparent independent charity. Challenge your teams to do competitive fundraisers Alan Sugar style. From cake bakes to team runs, car washes to car boots there’s plenty of ways to raise funds and ignite that creative spark every company needs. An oldie but a goodie that most people find irresistible! Get everyone to bring in their unwanted clothes . Pay a £5 donation and choose 5 new items. Work out the cost of your normal takeaway and donate the total, or make your own equivalent and donate the difference. Hold a lunch time quiz with your fellow departments and stir up some friendly rivalry… remember the quiz master is always right! Our onsite community events have been getting bigger each year and we need your help to sustain them. From programmes to raffle prizes, medals to performers can you help us to ensure there is minimal costs to the charity? 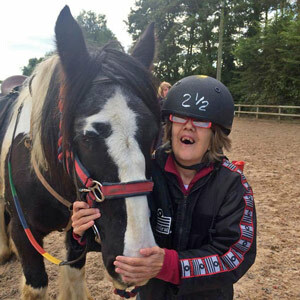 Horse-riding, swimming, fishing, trampolining, arts, crafts, media, gardening, drama they all come at a cost. Would your company be able to help sponsor an activity to ensure that activity continues to be available? Maybe you’re a plant supplier and can help with the gardening, or enjoy a day at the races and would like to sponsor the horse-riding. There are plenty of activities to choose from and in return, if you choose, we will let others know how you’ve supported us. Acorn Village continues to develop and grow, people’s needs change over the years and we need to cater for them. Our latest projects have included creating new all accessible accommodation, accessible kitchens and soon to come in 2018 a specially designed kitchen for visually impaired adults with learning disabilities. These have only been possible thanks to the generosity of others. Find out how you can help by visiting our projects page. 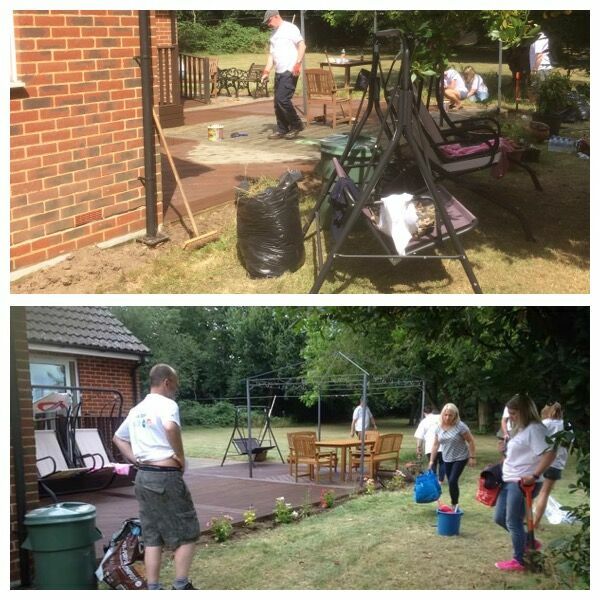 Sports Days, fun Days, gardening, painting, event preparation have all taken place by Corporate Teams over the years and we are so grateful for it. Not only does this encourage team building and motivation for the staff it also can widen their social experiences. One particular team told us how honoured some of the staff felt to come directly to the charity and see the difference they personally made. They had never met adults with learning disabilities before, they came feeling very apprehensive and left having made new friends. 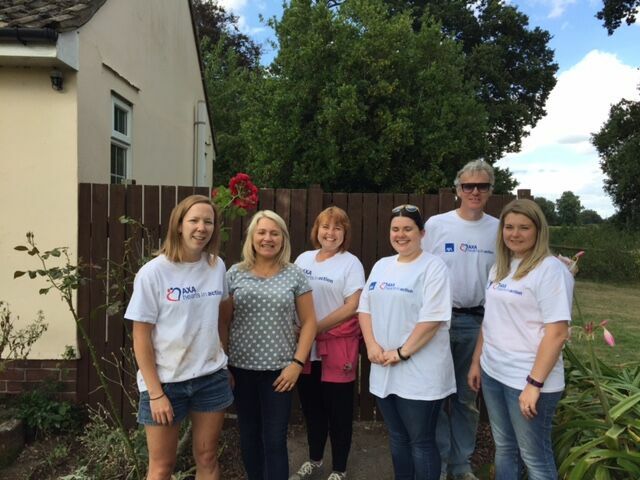 As part of the AXA Cares volunteer programme we have proudly been supporting Acorn Village since 2014 and as a team we have all found the time spent volunteering to be a rewarding experience the residents and staff are always welcoming and truly appreciate the work we do, from getting ready for the annual dog show to gardening and deck painting, it always surprises us what can be achieved in a day. We look forward to continue supporting this very worthwhile charity for many years to come. 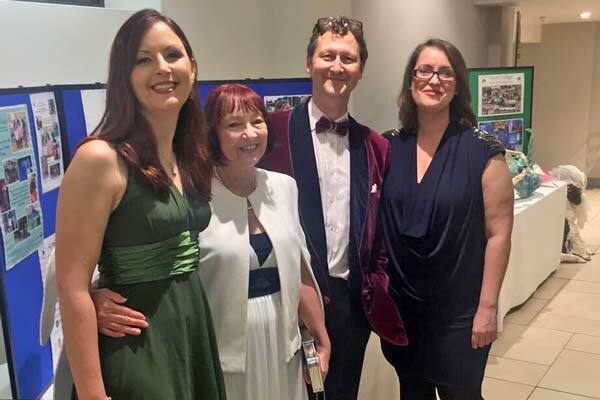 We are very lucky to have the support from local magazines who kindly advertise our Events as well as charity updates such as interviews with the Acorn Artists. Can you help us to reach a wider audience by advertising locally where you are? From putting up Event Posters to advertising the Acorn Village Charity in your magazine we need and appreciate all the help we can get. We’d like to say a big thank you to all of the businesses who support the charity through fundraising, donations, time or materials.